AMD is now bundling Total War: Warhammer for those buying a Radeon R9 390 graphics card or AMD FX 8-core CPU (or in certain cases, a qualifying system containing one of those components). This fresh bundle becomes available today and the offer runs through until August 15 – either that, or when the supply of free codes for the game has been exhausted, which may well come before that date. Also be aware that you need to redeem the offer within two months of the end of the promotion, so if you fail to cash in your AMD voucher before October 15, it will expire and you'll be out of luck. AMD notes that it partnered up with developer Creative Assembly to tune the game's DirectX 12 graphics performance which will hopefully ensure that this latest Total War outing will run relatively fluidly even with the usual masses of units milling around on-screen. 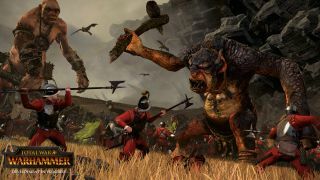 This Warhammer game is of course a very different effort that pitches into the fantasy arena compared to the usual historical settings the Total War series has visited. As we pointed out in our recent first look at the title, one thing it does very well is provide a faithful representation of the tabletop war game, which will ensure a hefty dose of nostalgia for anyone who used to spend hours painting their Citadel Miniatures to get them ready for battle. It certainly sounds like it's a very deep strategy game, albeit one that the uninitiated may struggle a bit to get to grips with at first.